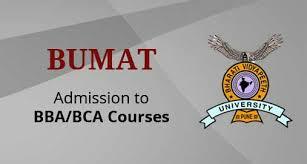 Submission: A candidate, desirous of seeking admission to BBA/BCA Programme should submit the BUMAT 2019 Application Form, duly completed along with payment of Rs. 1200/- towards BUMAT 2019 Entrance Test Fee in cash or through Bank Draft on any Scheduled Bank or on any branch of Bharati Sahakari Bank Ltd.
DD: Drawn in favour of “The Registrar, Bharati Vidyapeeth Deemed University” payable at Pune. Registration: The registration for the BUMAT 2019 examination has to be done offline. Download: You can download the BUMAT 2019 form from the official website of BUMAT. Fees: The BUMAT 2019 forms are accepted up to May 2019 along with the application fees. Details: The candidates are required to fill in details like personal, contact, educational, upload photograph & signature in the BUMAT 2019 form. Payment: Along with BUMAT form, the candidates are required to pay a requisite BUMAT application fee using any of the available modes. Incomplete: An incomplete BUMAT Application Form or a BUMAT Application Form which is not accompanied by necessary payment, will not be entertained and processed.